14 Comment(s) Guzzler First Week Joined in the very first week of SmileBASIC Source Website Drawing I like to draw! Hobbies Intermediate Programmer I can make programs, but I still have trouble here and there. Programming Strength 2 months ago Here's a large problem: selling things at the shop doesn't work because you need to press START. Other than that, this is pretty neat. I'd love to see this be improved, as this was such a nice game, and it would be great to play more. IAmRalsei Forum Leader Hidden Achievements First Year My account is over 1 year old Website Expert Programmer Programming no longer gives me any trouble. Come to me for help, if you like! Programming Strength 30 days ago Pressing SELECT after installing 3.6.0 should work for that. Z_E_R_O Intermediate Programmer I can make programs, but I still have trouble here and there. Programming Strength Night Person I like the quiet night and sleep late. Express Yourself Zelda Is Awesome! I love The Legend Of Zelda! Express Yourself 2 months ago are you going to perfect this? MYCRAFTisbest Good Page Hidden Achievements Video Games I like to play video games! Hobbies Deep Sleep Hidden Website 2 months ago I don't know if I would go as far to say perfect but there is intention to improve it at least to the point where everything is fully playable. In fact, the current unreleased version is close due to a change in how palette emulation works. It has corrected issues with the corrupt world generation and fishing (since village uses a GRP with colors on it to save data). 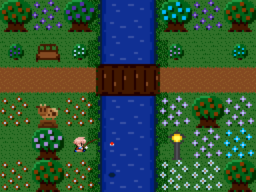 The sprites also change color based on time of day. On the file conversion side of things, the dialog file has been properly converted over as well so the people in the town now speak. This has yet to be released because of issues with the way village changes its graphics palette which is currently not emulated properly causing colors to appear wrong. Once I have time to fix this, it will be released. Z_E_R_O Intermediate Programmer I can make programs, but I still have trouble here and there. Programming Strength Night Person I like the quiet night and sleep late. Express Yourself Zelda Is Awesome! I love The Legend Of Zelda! Express Yourself 2 months ago It's amazing that Smilebasic has an emulator at all so props to you. Great job, and just take your time. snail_ QSP Contest 1 Contest Participant I participated in the first SmileBASIC Source QSP Contest! Helper Received for being very helpful around SmileBASIC Source Achievements Amazing Contributor Someone thinks I'm an awesome person who has done so much for the community! Achievements 2 months ago It's not really a full emulation, but a code conversion tool + middleware to adapt the PTC environment to the SB one (like Wine, I guess.) Not to diminish the work though, it's not easy to do (which is why it is far from complete.) spaceturtles Video Games I like to play video games! Hobbies Avatar Block I didn't change my avatar for 30 days. Website Intermediate Programmer I can make programs, but I still have trouble here and there. Programming Strength 2 months ago So is it a port? snail_ QSP Contest 1 Contest Participant I participated in the first SmileBASIC Source QSP Contest! Helper Received for being very helpful around SmileBASIC Source Achievements Amazing Contributor Someone thinks I'm an awesome person who has done so much for the community! Achievements 2 months ago technically yes, technically no. MYCRAFTisbest Good Page Hidden Achievements Video Games I like to play video games! Hobbies Deep Sleep Hidden Website 3 months ago So, I just found a house and realized no one has anything to say. It's just an empty dialog box. Why would anyone leave this beautiful town? auceps OSP Contest 1 Contest Participant I participated in the first SmileBASIC Source OSP Contest! OSP Contest 2 Contest Participant I participated in the second SmileBASIC Source OSP Contest! OSP Contest 3 Contest Participant I participated in the third SmileBASIC Source OSP Contest! 3 months ago [ ] IAmRalsei Forum Leader Hidden Achievements First Year My account is over 1 year old Website Expert Programmer Programming no longer gives me any trouble. Come to me for help, if you like! Programming Strength 3 months ago i think I'm going to play new leaf instead of this IAmRalsei Forum Leader Hidden Achievements First Year My account is over 1 year old Website Expert Programmer Programming no longer gives me any trouble. Come to me for help, if you like! Programming Strength 3 months ago Mycraft is back! 12Me21 Syntax Highlighter Received for creating the code syntax highlighter on SBS Night Person I like the quiet night and sleep late. Express Yourself 3 months ago just how I remember MYCRAFTisbest Good Page Hidden Achievements Video Games I like to play video games! Hobbies Deep Sleep Hidden Website 2 months ago Lol. Is this any better?